Reaching a significant milestone at work is a notable achievement. It demonstrates longevity, loyalty and the skill or ability to do whatever job it is well. Let’s face it, if you’ve managed 5 or 10 years with the same company you must be doing something right! But whilst reaching an anniversary at work isn’t as important as something like a big retirement, it’s still worth celebrating. If only through a small gesture. And one of the most common ways to acknowledge a big milestone like this is with cards and work anniversary quotes or messages for your colleague or friend. A funny or touching card and message is a great way to let someone know how proud or pleased you are of them for their work anniversary. But knowing what to write and say in the card can be a little tricky. 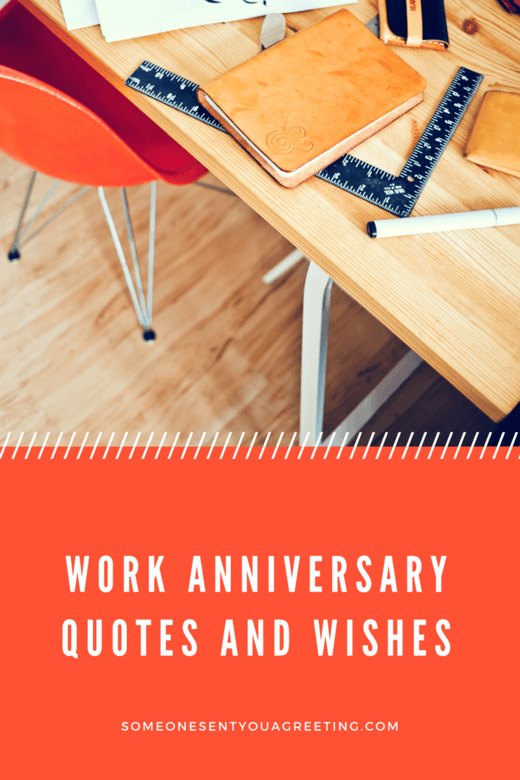 Which is why we’ve put together this resource of the best work anniversary quotes and wishes. Use the large collection below to wish a friend, colleague or boss congratulations on their anniversary. You could even buy them a small gift to go with your card. Or if you feel like that’s too much then you can use one of the quotes below on their Facebook page or just to say in person. So take a look below at the work anniversary messages below and we’re sure you’ll find what you need to let whoever it is know just how pleased you are for them. Use one of these wishes and messages to congratulate anyone on their anniversary at work. Congratulations! I think all your hard work calls for a party! To my partner in crime and desk buddy – congrats to another year in the rat race. Have a happy work anniversary! We wish you all the best for your 10. Anniversary and hope that you will stay for another 30 to 40 years. Happy anniversary! Celebrate with your friend on their work anniversary. Tell them just how valued they are at work and what a big achievement it is to have reached this anniversary. We’re celebrating your anniversary today but it won’t be long until we’re congratulating you on that big promotion! You probably work alongside lots of successful and hard working colleagues. When they reach a big anniversary at work then use the wishes below to congratulate them. I know we only met last year but I wanted to congratulate you on your first year of working here. 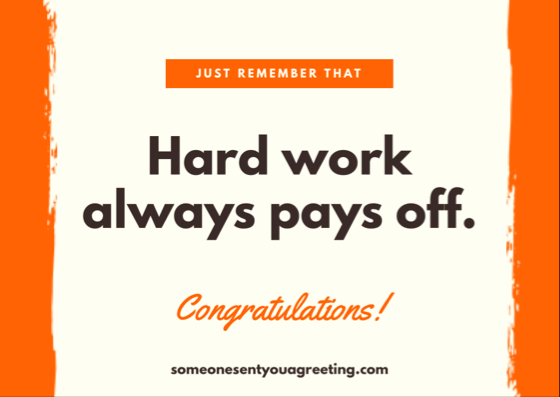 Keep going – your doing great! Congratulations on your anniversary with the team! Looking forward to many more successful years with you! 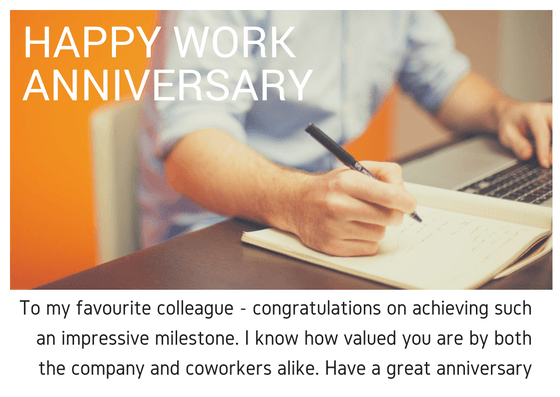 They might be your boss but reaching a big work anniversary deserves congratulating and celebrating even if they are in charge. Let them know there’s no hard feelings for bossing you around with one of these quotes. Seeing as it’s your anniversary today how about going a little easy on us? Congratulations! To the best boss in the world – happy work anniversary!